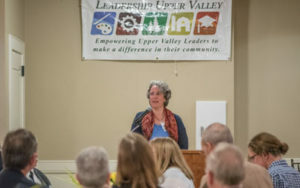 At the May 19th 2016, Heroes & Leaders celebration of mentors in the Upper Valley, Elizabeth Sawin, Co-Director of Climate Interactive delivered a keynote speech focused on what she learned about mentoring from one of her mentors, long-time Upper Valley resident, Donella (Dana) Meadows. Elizabeth worked with her from 1995 until Donella’s death in 2001. We asked Elizabeth to share the list of six traits of mentorship that she outlined in her speech in this blog post. The Academy for Systems Change has permission to repost this article. We wish to share Elizabeth’s words because she so beautifully represented the giving spirit and heart of Donella Meadows in this keynote tribute. We hope that you enjoy!